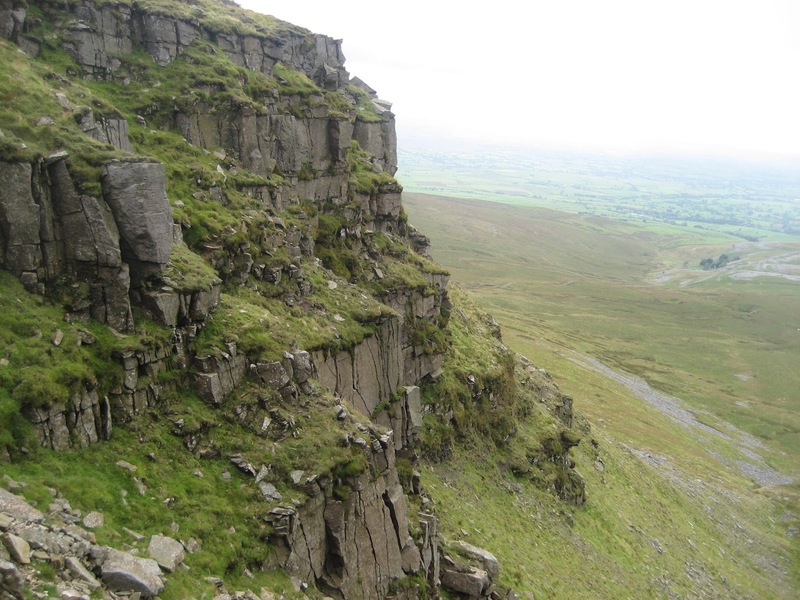 Along with Whernside and Pen-y-ghent, the main ‘cone’ of Ingleborough is made up of a series of limestones, shales and sandstones that repeat in cyclic patterns and are particularly prominent in ‘Yoredale’ (the former name for Wensleydale) which has given them their distinctive name. They were laid down in the Late Carboniferous Period and are famous for forming ‘stepped’ landscapes where more resistant rocks contrast with the softer shales. These great rocky sandwiches lie above the top-most layer of Great Scar Limestone: the Girvanella Band, which is characterised by large nodules of algae and can be seen well in the bed of Fell Beck close to Gaping Gill, as well as at Newby Moss. Each cyclothem, or repeating pattern of rocks, is easily explained due to the continual rising and falling of sea levels in the late Carboniferous. Clear shallow seas allowed limestone to form, but as sea levels dropped, rivers washed in silts and muds to form shale, while further shallowing resulted in sandstone formation – before the process began all over again. Sometimes the Yoredales show very thin layers of coal, formed when sea levels dropped so far that vegetation was able to flourish for a relatively short period. 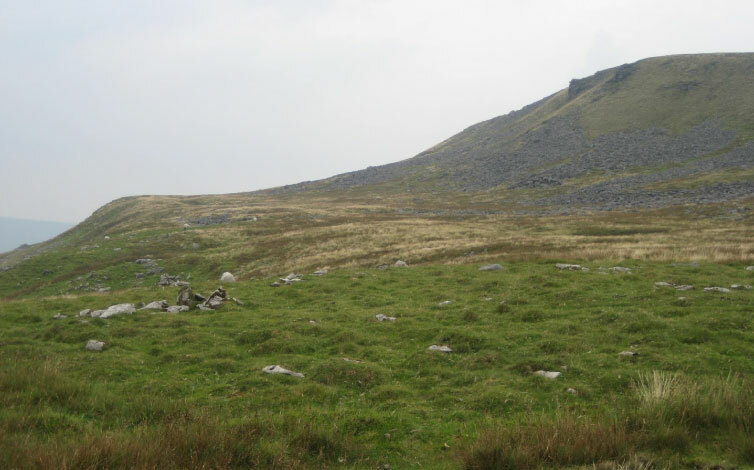 As we climb Ingleborough’s steep slopes, particularly around the Falls Foot landslip, we pass the various bands of limestone within the Yoredale Series, each of which bears its own name. 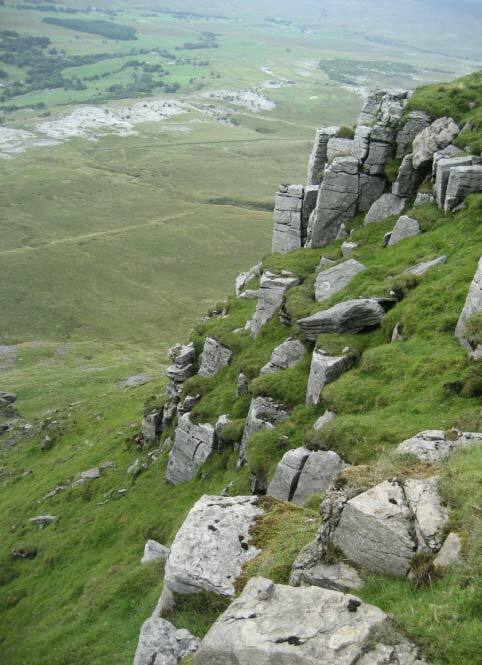 Just above the Great Scar Limestone plinth we have the Hawes Limestone, while the highest limestone on the mountain, just below the summit cap, is a relatively wide band known as the Main Limestone. 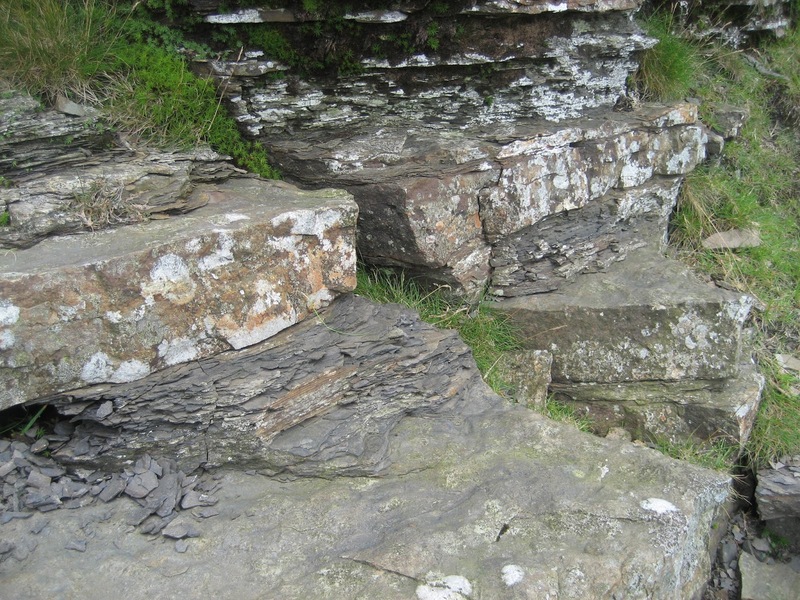 Compared to the Great Scar, Yoredale limestones are often weak in structure and fossil rich. The rocky sandwiches of the Yoredale Series are an essential part of the Dales landscape, creating spectacular terraces which shelter a variety of rare plants. Exploring them, and picking out the various repeating cycles of rock, can become highly addictive!